Paperjam.lu: "L’approche participative du gouvernement sur la 5G"
""L’objectif était d’impliquer un maximum d’acteurs dans la définition et la mise en place de la stratégie nationale." L'essentiel: "La 5G, «c'est bien plus que de la bande passante»"
"Cette introduction est menée en commun avec les autres pays de l'Union européenne." "Austauschplattform zwischen Privatunternehmen und Bürgern und den staatlichen Stellen über Wünsche und vielleicht auch Sorgen bezüglich der 5G-Technologie." RTL.lu: "Mat der Technologie Schrëtt halen"
"Fir dës Technologie virun ze bréngen, sëtzt d'Regierung dofir mat dëser Konferenz op den Dialog mam Industrie-Secteur, mat klengen a mëttlere Betriber, ma och mat lokale Communautéiten a mat Privat-Persounen." On November 29, Prime Minister Xavier Bettel welcomed almost 200 participants at the first 5G conference in Luxembourg. In his welcome address, he stressed the need for a swift deployment of 5G in Luxembourg and in Europe. “Applications can be developped in all areas: in our homes, in our cars, in the health services, in our industries, in the cultural domain, just to name a few”, said Mr. Bettel. The conference gathered participants from very different backgrounds: CEOs, CIOs and CTOs from telecom or IT companies as well as their engineering and marketing teams, national and international consultants, representatives from regulatory and public authorities as well as citizens and members of NGOs. The three highlighted speeches gave the participants the necessary insight into current 5G deployments (Prof. Dimitra Simeonidou), into a design-thinking approach to deploy customer-oriented 5G services (Tanguy De Lestré) and into the larger visions on how modern communication technologies will change our lives (Dirk Neugebauer). The main part of the programme, though, was dedicated to a total of 28 workshops. The outcomes of these workshops will serve the participants to draft future projects. Where needed or requested, the 5G team of the “Service des Médias et des Communications” will offer the necessary support or guidance. The facilitation of the workshops was inspired by the Open Space Technology (OST) methodology - a method for organizing and running a meeting or multi-day conference, where participants have been invited in order to focus on a particular purpose. Prof. Dimitra SIMEONIDOU will share some hands-on experiences from the testbeds from in and around Bristol. She is the director of the Smart Internet Lab at Bristol University and member of the UK 5G Advisory Board. Bristol is one of the leading UK 5G pilots. Tanguy De Lestré, currently ecosystem manager at Smartbelgiumservies, focusing on roll-out of smart technologies in cities. He has a degree in Political Sciences, European studies, and Information management. Global and Smart city challenges - will 5G have an impact on it? 5G, so what? - How to make sense out of the hyper-connectivity! Dimitra Simeonidou is a Full Professor at the University of Bristol, the Director of the Smart Internet Lab and Head of the High-Performance Networks group (HPN). Her research is focusing in the fields of high performance networks, programmable networks, wireless-optical convergence, 5G and smart city infrastructures. Dimitra has been the Technical Architect and the CTO of the smart city project Bristol Is Open. She is currently leading Bristol’s 5G urban pilots. Tanguy De Lestré, currently ecosystem manager at Smartbelgiumservies, focusing on roll-out of smart technologies in cities. He has been advisor on ICT and Smart City to the Brussels Government between 2016 and 2018. From 2002 on he managed emerging technology company clusters in mobile apps, drones, GIS systems at Belgian ICT industry federation AGORIA. He was member of the Belgian advisory telecoms committee and coordinated the works of the Belgian Mobile Operators Forum and the mobile site sharing association. Tanguy De Lestré has a degree in Political Sciences, European studies, and Information management. His interest lie in the interlinkage between societal trends and technology innovations. He is active in several #forgood initiatives, and was founder of the Belgian mobilemonday chapter. Dirk Neugebauer believes in human-centered design solutions enabled by disruptive technology. Currently Dirk is ramping up a European wide disruptive strategic design and innovation boutique with a strong focus on 5G, AI and robotics. In Dirk Neugebauer’s most recent assignment as Executive Director and Global Practice Lead IoT & connected Products, Reply Group —he was tasked with transforming the culture, core IoT processes, and governance to accelerate innovation; and driving enterprise-wide deployment of the latest digital technologies such as AI, AR, IoT, blockchain and digital twins. Dirk’s prior career spans two and a half decades of manager and officer-level assignments at global design & technology companies (Designit, Digitas, Saatchi), directing the development and market deployment of breakthrough solutions. His leadership profile is marked by a collaborative approach at the executive level and a dedication to managed personal accountability at the operating level. Art Square Lab, is a service design agency based in Luxembourg, established in 2017. They focus on service innovation using human-centred design, that helps them create exceptional digital and physical customer experiences to transform your business. As specialists in customer experience they use creativity to help clients in public and private sectors to understand their user, create great value proposition, prototype and test the solution of online and offline services. In their work they use various methodologies like Design Thinking and Open Space Technology. 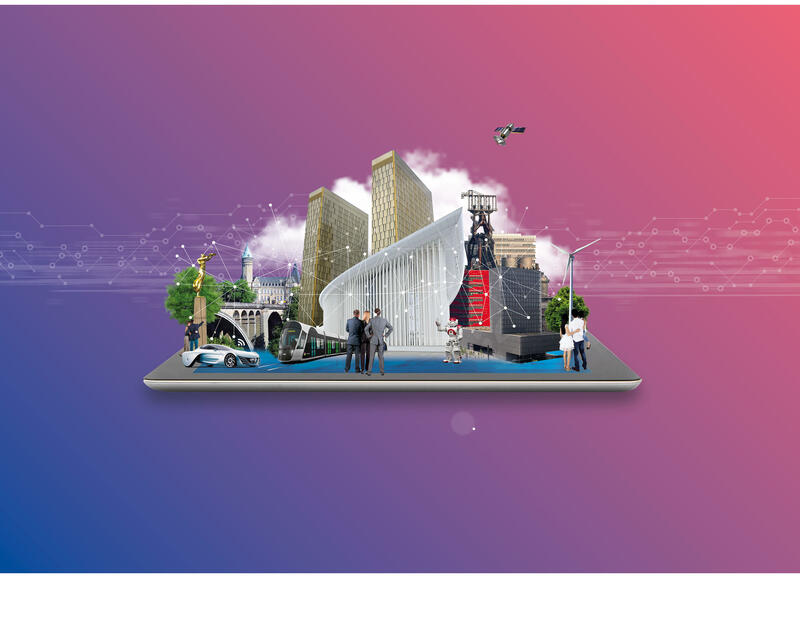 Digital Luxembourg is a collaborative, multidisciplinary government initiative launched to unify & strengthen the country’s digitalization efforts. We are both a uniting force behind Luxembourg’s digitalization movement and its biggest ally. Inclusive, multidisciplinary and fluid, guiding the country’s digital efforts. Digitalization is inevitable. Let’s keep it positive, smart and human. When a group of people work together to advance a common goal, a movement is born. In Luxembourg, our goal is simple: transformation via positive digitalization. For the biggest impact, we focus on modernizing and future-proofing five key areas: Government, Skills, Policy, Infrastructure and Ecosystem. The Department of Media, Telecommunications and Digital Policy is part of the Ministry of State and directly reports to the Minister for Communications and Media. Since its creation, it has been supporting the development of new IT technology and media. Among others, it is in charge of the electronic communications (implementation of the ultrahigh speed Internet – wired and wireless). The Department manages the coordination cell of Digital Luxembourg, in collaboration with the Ministry of the Economy and the Ministry of Finance.